[New for 2014] I've decided to start this post with a disclaimer. Yes, the disclaimer that your mileage will vary greatly with any and all DQ reviews. Mine was lacking, but maybe yours was better, I don't know. 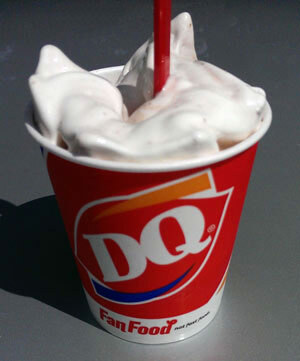 What I do know is that Chips Ahoy is celebrating their 50th birthday today, so what better day to head down to Dairy Queen and try the August blizzard of the month. And here's my underwhelming treat... it's been overblended, hasn't it? Well, the good news is that there is a Chips Ahoy flavoring here. It's light at first but I do a little spoon blending to improve things a smidge. There are very few "big" chunks (pea size at best), instead, I see crumbs everywhere, and there are tiny chocolate chunks everywhere, and it's just so... so... boring. I wanted to be overwhelmed with flavor and crunch but instead I'm just glad I only got a small. Double the chips and cookie bits here and MAYBE we'll have ourselves a decent blizzard. Sorry, but this blizzard has failed me today. I definitely had my doubts when I saw this on the blizzard calendar. I made a thousand chips ahoy sundaes as a kid, so it's not like I'm not a fan boy, but I just wasn't sure it could transition to this medium. There's just not enough flavor there to start with. You add chips ahoy to a sundae for crunch and not so much for flavor, and this proved that today. The whole time I kept thinking "What would I add to make this better?" Or maybe I just got a mini's worth of mix-ins in my small sized blizzard.... as always, please share your own experiences so we can see if this is a fluke or a trend. Note: I've seen pics of blizzards that look 100x better then mine. Curse your inconsistancy DQ! --- I will try this one again... really... I mean it.... sooner or later! August 30th Update: We did finally make it back to DQ, but this is actually my daughter's blizzard because I wound up going with the new Apple Pie blizzard. At least hers looks better then mind did, though she wasn't impressed... she said the commercial made it sound way tastier than it was. I asked her what was wrong, and to my surprise, she goes "too many chocolate chips". I'll take that to me "not well balanced". what a sad looking blizzard - looks more like a milkshake! Were the cookies soft or crunchy? I had a little bit of a better experience then you did and really enjoyed mine. My one complaint was after the top of mine there were very few pieces of cookie there (more just the crumbs as you mentioned). When I got a cookie piece with everything else, though, it was delicious. Looking forward to going and grabbing this one again this month before it goes away. When you say that the cookies were over blended, are you saying that they were grounded up so much by the mixer that they were incorporated into vanilla base? The mix would then have a cookie flavor. 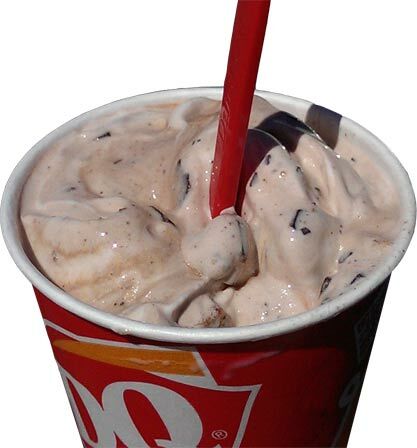 Does the DQ mixer spread the mix-ins or does it actually pulverize them into mini chunks? I always thought they just spread the mix-ins. 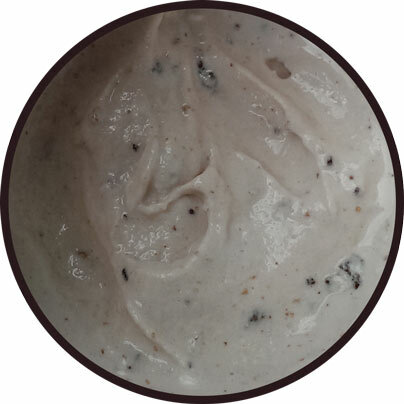 @stride: overblended means that instead of big fun chunks, we get tiny specks of cookie. sure it would add flavor and texture IF there are enough of them. That's too bad. I love Dairy Queen, in general. 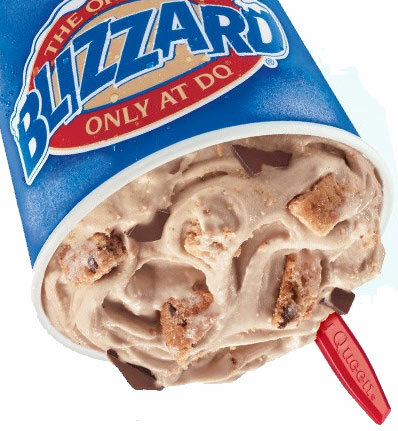 The thing is, I don't know what a Blizzard is supposed to be, so is a milkshake bad? I do agree that if there is a mix-in, it better say something! @Donna: dont take this the wrong way, I know it will sound mean, but how can you love DQ but not know what a blizzard is? I mean, I know many are addicted to their dipped cones and that's all they get, but surely you've seen the pictures of blizzards on the menu? Big chunks of stuff blended in to DQ soft serve, served with a spoon, surely you've seen them. Off topic, but got to try Baskin Robbin's flavor of the month last night "Oreo Nutty Salted Caramel". Worth trying if you have a chance. The peanuts weren't abundant, but when they were there it was a great bite. Figured I'd followup on this, because I decided to go back to DQ for another try on this one and glad I did. Holy big cookie pieces! I must say, if you get this one without it being over mixed the results are definitely delicious! Mine (the two I have had actually) have been PHENOMENAL! Probably my second favorite choice to the Whopper Blizzard which I don't think exists anymore! Thx for your review!